I decided to learn more about her. 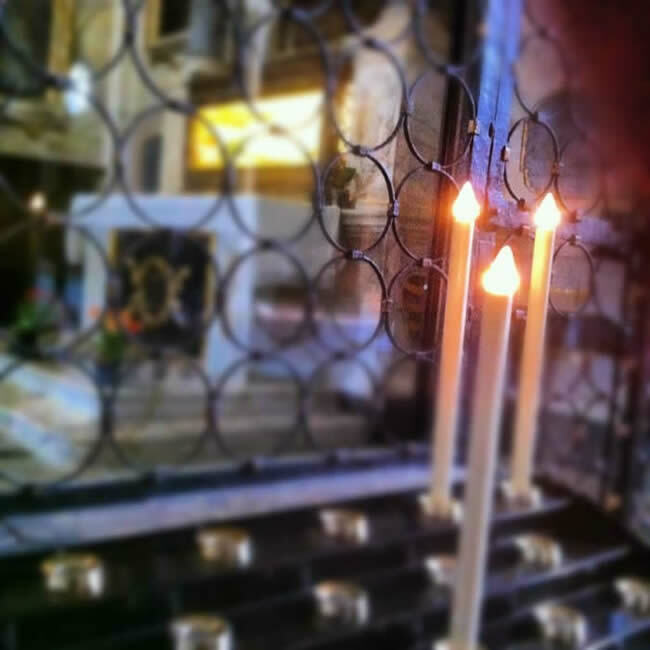 So later that day, I pedaled my trusty and rusty bicycle to the church of San Frediano, my favorite church in Lucca. And just to the right, an entire room dedicated to Santa Zita. There are paintings showing her miracles all around. 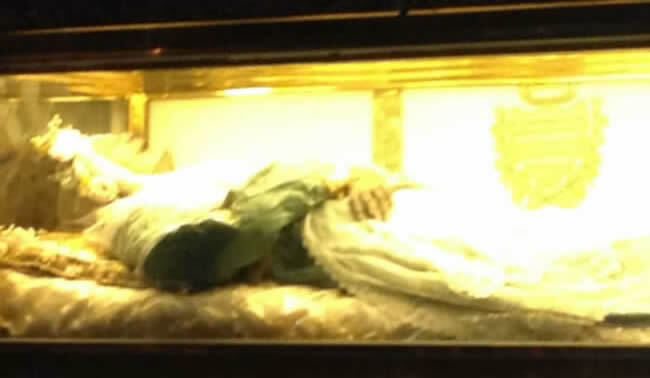 And inside the box, the 750 year old body of little Zita herself, wrapped in silks and covered with flowers. 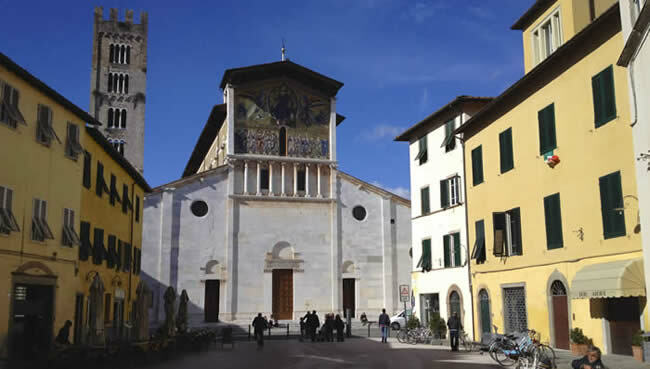 In the 1200s, the small nation/state of Lucca was florishing due to the local production of red and gold silk. There were palaces and homes and beautiful churches under construction everywhere in the medieval town. But the wealth was concentrated and the poor suffered from hunger and sickness, aggravated by a vicious war with neighboring Pisa, which left the street full of orphans and beggars. 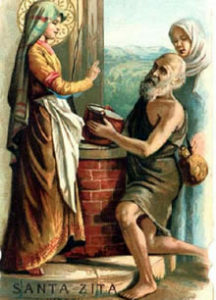 They humbly offered their 12-year-old daughter as a servant to the household. Litle Zita was reluctantly accepted, given a tiny space in the attic to sleep, and put to work. Zita was indefatigable and joyful, and served the family with humility and kindness. She was also unusual. For one thing, she refused any offer that might be considered a vanity, whether it be a new dress, an extra portion of food, or the many offers from men who courted her. And she went barefoot her entire life, summer and winter, insisting that she didn't need shoes. She was also profoundly religious. Zita was constantly praying, quietly and joyfully. She worked long hours. But still found time, at night, to go to the San Frediano church (where her body now lies), just a block from the Fatinelli house. 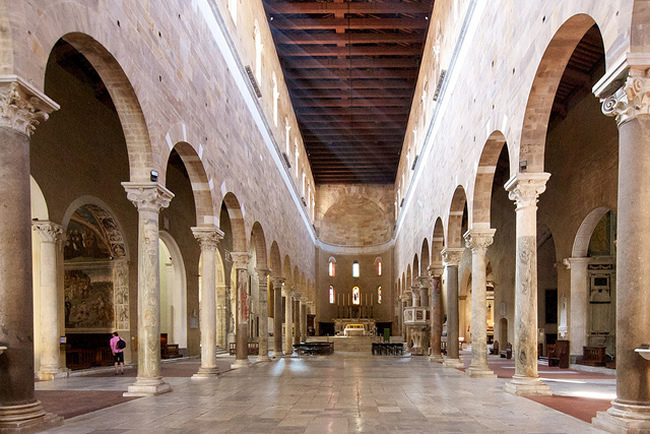 There, she would kneel on the cold marble floor at the back of the church, and pray so long that the priest would tap her shoulder and ask her to leave, so he could close the church, at which point she would kneel outside in the dark, to finish her prayers. And her charity was apparently limitless -- she gave away her meager salary to the poor, and spent her free hours feeding, embracing, and comforting the sick and starving in the streets and surrounding countryside. She served them with great care and humility her entire life, never thinking to mention her work to others. 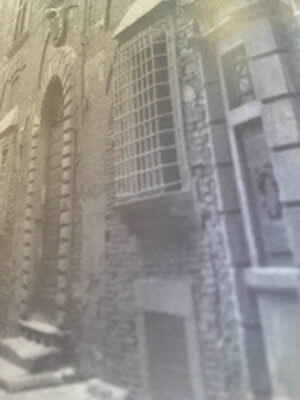 But word spread of her irrepressible kindness, and there were frequent knocks on the door of the Fatinelli palace, by hungry people asking for a handout, and she never refused, often giving her own portion of food if no leftovers were available. Her constant charity won over the rest of the staff and also the population, whose attitude changed from teasing, to grudging respect, until they started following her actions in some measure. One thing we know, is that she was genuinely loved by all. Her master Pagono was a harder nut to crack. 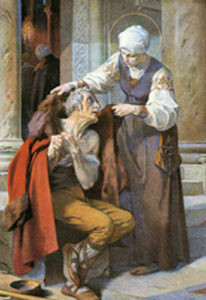 He accepted that she was an outstanding servant. But he was used to the cutthoat world of merchants, and he considered her a fool, although perhaps in a fatherly way. He also feard that, somehow, he was being taken advantage of, although he couldn't explain how, and this made the powerful man angry. Although it was 750 years ago, we know a few particular incidents from her life. One winter evening, she was leaving, barefoot, for the church, when Pagano insisted that she put on one of the family's expensive coats, with the admonition that the foolish girl not give the coat away to the first freezing beggar she met. She, of course, loaned it to the first freezing beggar she met, who promptly vanished into the night. Distraught, little Zita returned home and confessed everything to her master. His rage was quelled by a knock at the door - the poor beggar returning the expensive coat of his own free will and thanking God for his little angel. 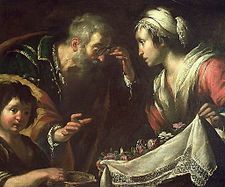 And as she grew, small miracles began to happen..
For one thing, as she prayed at San Frediano church, from her position kneeling on the cold marble floor at the foot of this painting, the other parishoners started to notice that she was speaking with Christ, and that the painting was answering her. Another day, she feel asleep on the marble floor of the church, and woke in the morning, too late to bake the household bread, which was her duty. As her fellow servants quickly gathered to try to help her, they found the pantry full of warm bread, and no one could explain how it had happened. 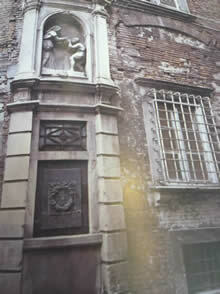 The palace had its own well and private fountain, still there and shown, in the photo below. Zita tended the fountain and handed out water to everyone asking for it. 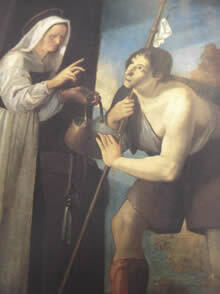 It was reported by several people, and recorded in many paintings, that the water she handed out had started to change to wine. There are many other little miracles. Zita was apparently the only person not amazed by these events, and quietly accepted them all without comment. Zita died in peacefully in her little attic, on April 29, 1278, at the age of 60. That could have been the end of her story - there are now just a few anecdotes surviving from her life (maybe believable and maybe not), and her little body in that box. But the reaction to her death, really shows how much she was loved, as a living and breathing person, by each person in the community. 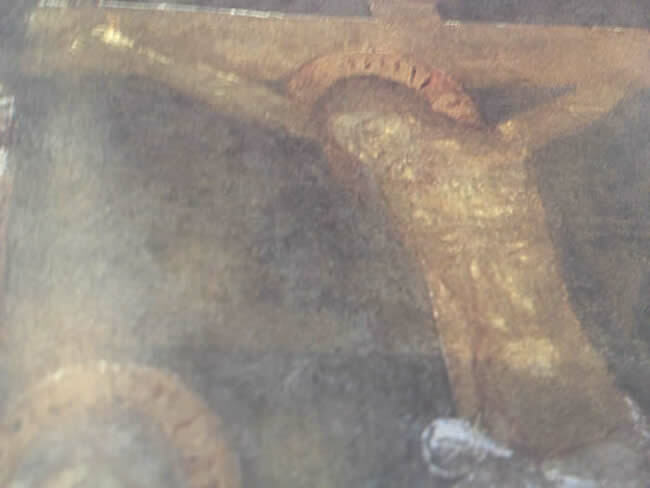 As word spread through the town, crowds started to converge at the church of San Frediano, where her body had been taken and placed in a temporary marble container. Eventually word arrived at the schools, where the children started crying, then screaming, until the teachers, also touched, let them run from the schools to the church. The crowds refused to leave, and her body couldn't be moved for days. The bells on the church, started ringing, by themselves. Outside, all the springtime trees, released their flowers at once, and the petals floated through the town, to everyone's amazement. At night, it was reported that a "comet" was seen overhead (I looked it up, there was a lunar eclypse in 1278). When the marble container was finally opened, in order to move her to a burial site, her body remained pristine, although 4 days had passed. 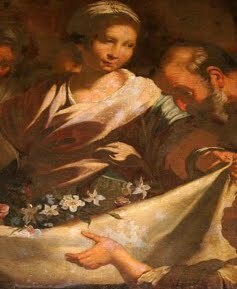 One of the most interesting miracles was, the effect that Zita's death had on her master Pagano, who had through the years, come to adore her and follow her example in some measure. He was distraught at her death, and continued supporting the poor and sick with his fortunes and kindnesses for the rest of his life. The effect of her death didn't pass. 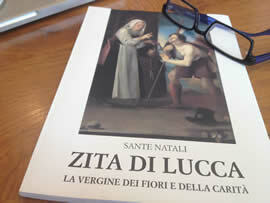 The people of Lucca started having an annual flower festival on April 29, the date of her death. This festival continues to this day -- all the piazzas near the church are filled with flowers. 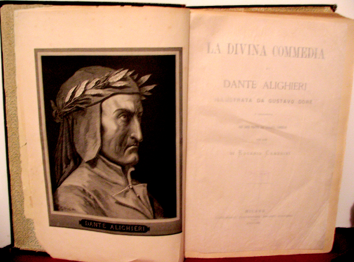 In 1314, thirty years after the death of the little servant, Dante finished writing the "Inferno", in which he refers to the people of Lucca only as the "people of Zita". 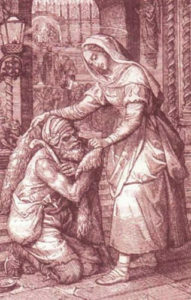 In the 1600s, little Zita was sainted by the Catholic church. Her body was exhumed, and found still intact. 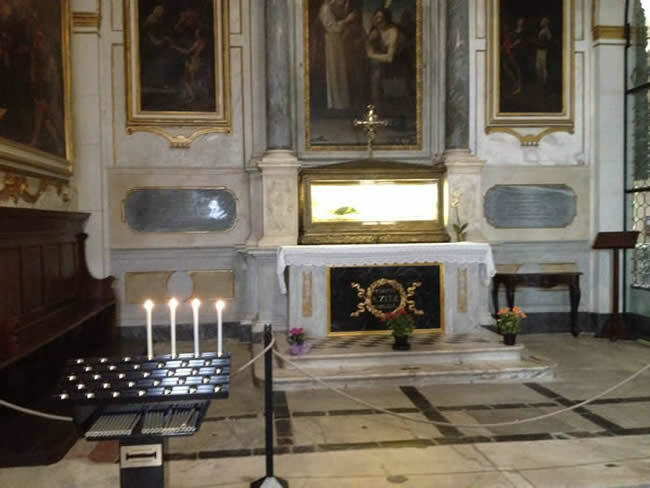 It was moved to a new room that was added to San Frediano church to honor her. Chapels started to appear worldwide, venerating her. And many works of art were created, depicting her life. 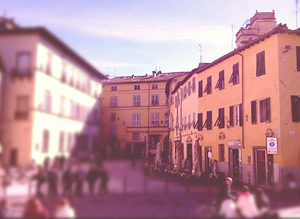 By 1821, Napoleon had conquered Tuscany, and Lucca was being governed by his sister, Elisa. She made gifts to Zita, who was moved to the golden box. In the 1900s, scientists started to examine Zita. Medical tests in 1948 and again in 1970 confirmed that her body had not decomposed normally, although it hadn't been embalmed. But her story still wasn't finished. In 1988, an expert team of medical scientists did a complete exam of the saint. They found that poor little Zita's frame was thin, missing all teeth, severe arthritis, and that her feet were deformed from going barefoot for 60 years. 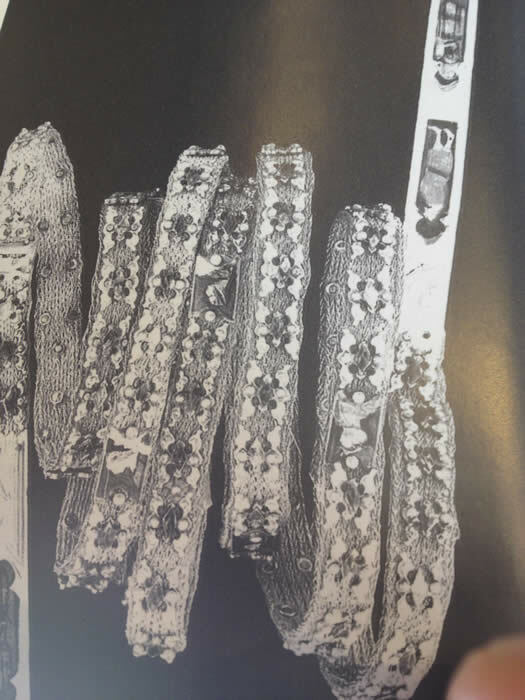 To their surprise, they also discovered, for the first time, a tiny belt hidden in her robes, of exceptional workmenship. 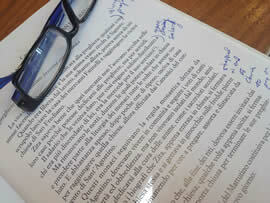 The evidence supports the idea that this was a final gift left with her, by Pagano Fatellini. I have a personal connection to Zita. 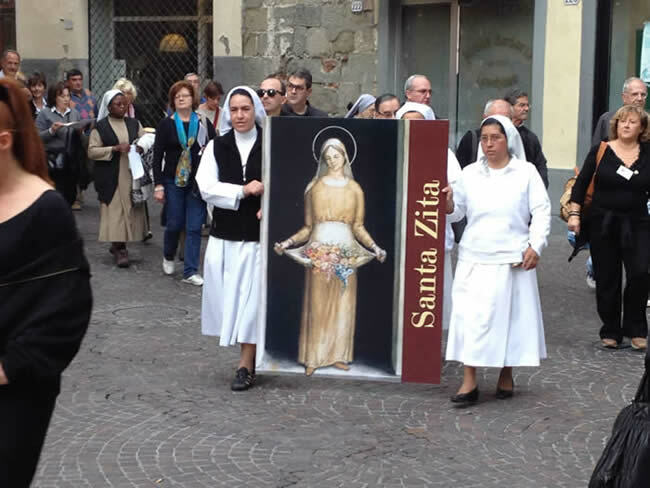 My wonderful niece Jane, visited me in Lucca, and liked the story of Santa Zita so much, that she chose "Zita" as her Catholic confirmation name.